Sony will be the unquestioned leader through the first five years of the current generation of console wars, according to a new report from Strategy Analytics. The research firm has released its Connected Home Devices Report, saying the PlayStation 4 "is on path to reproduce the success of the PlayStation 2 and Nintendo Wii." Strategy Analytics predicts that by 2019, Sony will have a global installed base of 80 million PS4s. That would give the company a 40 percent edge on the firm's projected 57 million worldwide installed base for the Xbox One. As far as comparisons to historical systems, the firm notes that the PS4's 18.5 million units shipped in the first year on sale is much closer to the pace of the dominant PS2 (20.1 million) than the initially disappointing PlayStation 3 (10.5 million). Looking at the Xbox One, the system's 12.4 million systems shipped for the first year surpassed the initially supply-constrained Xbox 360's first-year performance of 10.4 million units. However, the report noted that the Xbox One has suffered from some of the same challenges the PS3 faced, like a higher price point than its competition. As for the Wii U, Strategy Analytics acknowledged its anemic 5.9 million in first-year shipments, but added the system has been "staging a modest comeback" on the strength of first-party software. "Despite reports to the contrary, the game console market is not dead," said Strategy Analytics senior analyst Eric Smith. "Core gamers have moved faster to this current generation than in any previous generation. The main difference in this generation is that casual gamers who bought a Wii are remaining largely on the side lines as free-to-play casual games and midcore games on tablets and smartphones have captured this segment of consumers." As for the Wii U.....added the system has been "staging a modest comeback" on the strength of first-party software. Comeback on what, the Vita? The Wii U was on sale a full year ahead of both the Xbox One and PS4 and has already been outsold by each in worldwide sales. 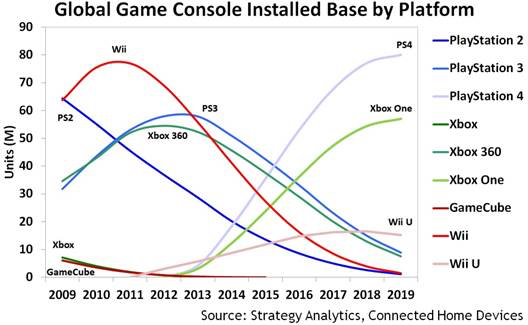 Thats far more impressive on Microsoft's part considering that the XBO sells nearly no systems(well technically they do but not in any significant numbers) in an entire territory(Japan) while the Wii U atleast sells moderately well there. As far as consoles goes the Wii U isn't catching up to either of the other two systems and it will only get worse for them from here on out. As for the other two systems, I also think the PS4 will maintain the worldwide lead in console sales the next few years but Xbox One will eventually catch up in US sales. This year will be a big one in predicting the momentum shift, particularly during the holidays from October thru Decemeber when the major first party exclusives come out for each. It will also be the first time Sony has any PS4 system sellers. Paul, it's a comeback on itself over previous year sales, not against the other consoles. As for the other two systems, I also think the PS4 will maintain the worldwide lead in console sales the next few years but Xbox One will eventually catch up in US sales. Think this is likely the truth. PS4's strength in Europe (outside the UK) and Japan will keep it well ahead of Xbox One on a worldwide basis, but I think Microsoft will edge ahead in the US before the end of 2015 (it's caught up with PS4 over there largely unnoticed) and I'd say it's in with a good shout of drawing level in the UK before the year is out, too. Things are very close in these two markets.